USB Flash Drives - HAVE Inc.
Quick, easy, reliable USB Flash Drives pre-loaded with your data and custom printed with your logo. Affordable solutions for promotional giveaways, corporate gifts, catalogs, software distribution, direct mail campaigns, music or art distribution, and more! USB Flash Drive media is the perfect solution for storing, transferring, and distributing your data and company brand to your customer list, or within your organization. Custom printed USB Flash Drives are great for promotional giveaways, software distribution, marketing presentations, catalog distribution, or music, movie and entertainment distribution, and more, at low, competitive prices! USB Flash drives come in a large variety of styles and memory sizes, and their portability, reusable format, solid state design, and long reliable life, make them a great affordable choice to distribute your message. HAVE can load your data on USB Flash drives with memory sizes from 1 to 16 gigabytes, plenty of space for your data, catalog, or program. Let HAVE duplicate and custom print USB Drives for you in quantities from 500 to as many as you need! 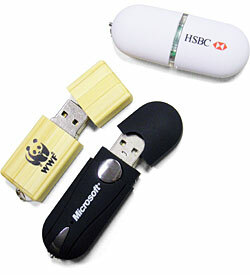 USB Flash Drives can be segmented with permanent information in it's own segment that cannot be over written. The rest of the drive is rewritable. So... If you're a company that wants to have your catalog on the drive, the catalog can be written to a segment and locked. This way, the recipient cannot overwrite the catalog and it will always be available. The remaining space on the drive is then available at the users discretion. Your customers will love an extra portable storage device to move data, and with your company or organizations logo printed on the outside, they'll think of you every time they use it! USB Flash Memory sizes 1GB to 16GB!